Before we get to the PIPA 2009 Expedition Greatest Hits, the expedition needs to officially end. What's the official end? It's a tough call. The moment we left the Phoenix Islands? The moment we got off the boat? The moment we all left Fiji? The moment we all arrived home? The moment when all of the scientific publications, National Geographic stories, videos, blogs, and medical articles have been published? Where should we draw the line? Well, I decided to draw the line when we all left Fiji. Though the responsibilities of the expedition members are far from over (and this blog will continue on for a while longer), the full team is no longer together. As I mentioned previously, David and Tukabu and Tuake are together in Tarawa presenting the initial findings of the expedition. The rest of us are preparing to leave Fiji to go home or onwards to other exciting locales. But before the next stage (whatever it may be), we must all encounter one final expedition-related excursion... the airport. You've probably been through this--check in 2 hours before an international flight. Pack the bags yourself. Limit yourself to 1 carry-on and a small personal item. No liquids. Usually 2 bags per person. yadda yadda. It's a different experience in bulk, let me tell you! We all flew separately to Fiji in the beginning, but the bulk of us left together (9 in total) on the same plane. For those 9 members, check-in lasted almost 2 hours and included 67 bags-worth of hassle. That's right, 67 bags for 9 people! Totaling it all up, that means an average of 7-8 bags per person. Given that there were 15 expedition members, we had over 100 bags total between us all... not counting the three giant crates that were shipped to and fro, containing the hyperbaric chamber (see Greg's earlier post for more on the chamber, and an early post by Brian to see some of the bags in the gear room onboard). Larry put it best - when I mentioned that I would title this blog "Leaving on a jet plane," he suggested an alternative: "Filling up a jet plane!" Because I used the radio call letters W-PIPA in my last post, I stayed true to the original title (Sorry, Larry). Bag trouble aside, we all managed to leave Fiji successfully, avoid any Tsunami issues (though we are all deeply saddened and concerned about Samoa and other relevant areas), and all of us have the Phoenix Islands Protected Area (PIPA) on the brain. "The word Kiribati, pronounced kir-ee-bas on account of the missionaries being stingy with the letters they used to transcribe the local language, is derived from the word Gilberts, which is the name of one of the three island groups that comprise this improbable nation. Located just a notch above the equator and 5000 miles from anywhere, Tarawa is the capital of this country of 33 atolls scattered over an ocean area as large as the continental United States. "The total landmass of these islands is about 300 square miles, roughly the size of the greater Baltimore metropolitan area, though I believe it halves at high tide. Most of Kiribati's land mass is found on Kiritimati Island (Christmas Island), several thousand miles away from Tarawa. What remains is not much [but includes the Phoenix Islands]. "To picture Kiribati, imagine that the continental United States were to conveniently disappear, leaving only Baltimore and a vast swath of very blue ocean in it's place. Now, chop up Baltimore into 33 pieces, place a neighborhood where Maine used to be, another where California once was, and so on, until you have 33 pieces of Baltimore, dispersed in such a way so as to ensure that [99%] of Baltimorians will never attend an Orioles game again [due to travel constraints]. Now, take away [most Western conveniences]. Replace [Northeastern U.S. shingled roofs] with thatch. Flatten all land into a uniform 2 feet above sea level. Toy with islands by melting polar ice caps. Add palm trees. Sprinkle with [remarkable musical talent and amazing dedication to PIPA]. Isolate and bake at a constant temperature of 100 degrees Farenheit. The result is the Republic of Kiribati." These were the thoughts as I had in my mind as I flew over Fiji and looked at a tiny, tiny portion of the vast Central Pacific on my way to New Zealand (where I will be for the next week). As I looked down on the big blue from ~30,000 ft, I was again struck with the theme of the trip: there's a lot of ocean out there. It's giant and blue and amazing and fragile, and there is still so much to explore. By the time I post this blog, every single one of the expedition members will have reached our next destination successfully. And so, I declare the expedition officially over. But, I also officially declare the next challenge: for all of us (including you!) to contemplate the sheer size, mass, area (pick a metric, any metric!) of the world's oceans, and think about what you can do to explore and protect them. In other words, live blue. The 2009 PIPA Expedition Crew; officially signing off. (Photo: Cap'n Jonathan). Stay tuned for the greatest hits and the scientific wrap-up (coming over the next several weeks). 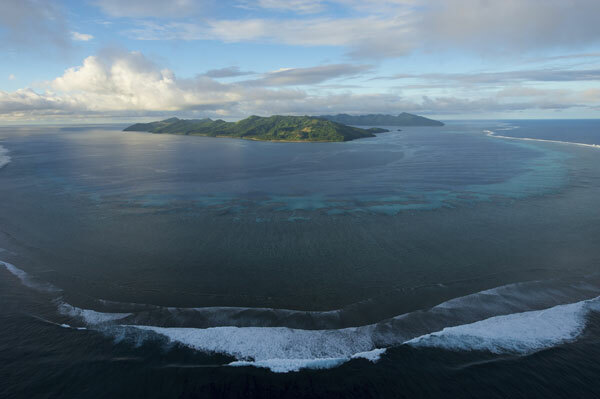 But since I've now left Fiji on a very full jet plane, over and out from the PIPA 2009 Expedition. Awesome! I have so enjoyed your blog, your tales of your journey and expedition, and I love your quoting of Troost.- I can feel it. Thank you- as I live vicariously through your stories. Thanks so much for reading and virtually joining us on our expedition! We appreciate it.